A 15-hour performance of one of the longest ancient poems has been performed in London. More than 60 actors took part in Homer's Iliad which tells part of the story of the Trojan War. 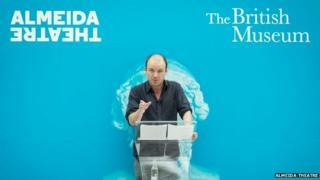 The performance started at the British Museum and finished at the Almeida Theatre. It was also streamed online. After the performance, director Rupert Goold tweeted: "Yesterday we made war together. Today @AlmeidaTheatre sends all our warriors love." Cast members included actors Simon Russell Beale, John Simm, Ben Whishaw and Brian Cox. Image caption Emma Cole said: "Who would have thought that people would queue to see a 16 hour reading of the Iliad?" People queued outside the British Museum ahead of the performance on Saturday morning. Emma Cole, who was among the audience, tweeted: "Who would have thought that people would queue to see a 16 hour reading of the #Iliad?" Katy Swift tweeted: "Never thought I'd find Iliad accessible- how wonderful it is! Bravo." For people just wanting a snapshot of the epic, @IliadLive tweeted the salient points of the poem in 399 tweets, the final being: "ILIAD UPDATE: it's finished. #iliad." The Iliad was performed as part of a one-off festival, Almeida Greeks, which runs until October and includes a number of debates about ancient and contemporary culture as well as stage productions of ancient Greek tragedies Oresteia, Bakkhai and Medea.